For the 2001 schedule and archived webcasts, please contact Audio Visual Services at 818.354.6170.
you can download the free RealPlayer 8 Basic. Both lectures begin at 7 p.m. 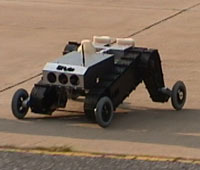 Mobile robots have many potential applications, from the science fiction concept of robotic housekeepers to the almost here-and-now visions of automatic office mail delivery, search and rescue in collapsed buildings, and unmanned reconnaissance in urban terrorist incidents. 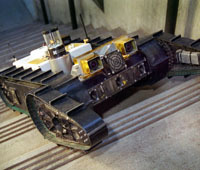 Many of these applications share two key requirements: a locomotion system that can travel on level surfaces, over curbs, up and down stairs, and over rubble, and an autonomous navigation system that can avoid obstacles, map the robot�s surroundings, and get the robot where its owner wants it to go with a minimum of supervision. �Urbie� is a JPL-built urban robot system that takes large strides toward achieving these goals. Work on Urbie progresses toward other goals of robotics research, including Mars exploration and a variety of Earth-based applications.